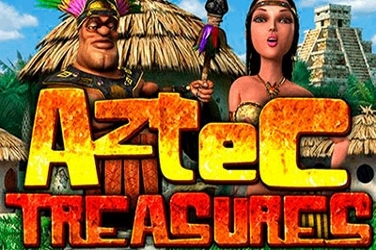 Microgaming released this online slots game in March 2016, however, some players may find themselves disappointed by its basic format. Based on a Chinese restaurant menu it may leave players feeling hungry but there are few Bonus Features to keep them entertained. The designers have used bright and bold colors in their graphics but there is an old-style feel to the game. Its 5 reels fill the screen and are set within a golden frame upon a deep red background. Sadly although the quality is there, Win Sum Din Sum slots are poor in its appearance compared to other online games that are available. 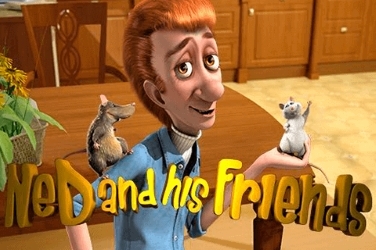 Game-play is available both on PC or laptop, as well as all Mobile devices. This means that players can enjoy this Chinese themed game whenever they fancy taking a bite of what the menu has to offer. Used as the lower paying symbols players will find the usual 10 through to Ace images upon the game’s reels. They have been given an Oriental twist and are ornately decorated with little trinkets including a dragon and some lucky coins. 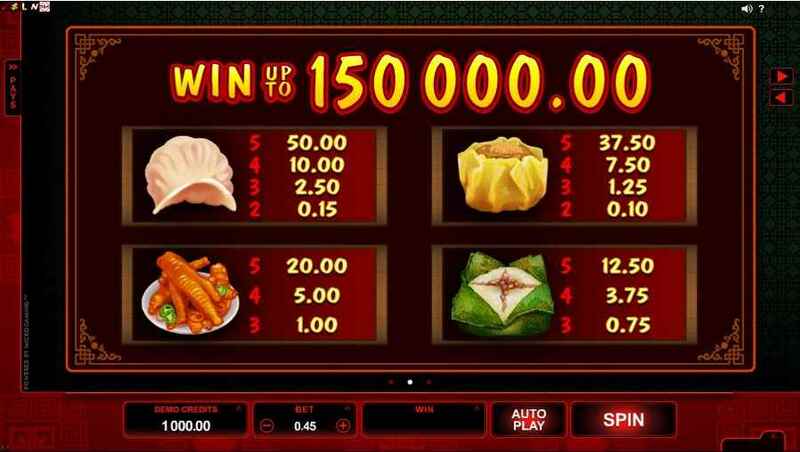 To achieve higher payouts players will need to locate the 4 food items which are the main focus of the Win Sum Dim Sum slots game. There is some Lotus Rice, Shao Mai, Sushi, and Har Gow to entice players to the table. The Dim Sum itself is the Wild symbol, with the game’s title shown across it. This is stacked across all 5 reels and can change any other besides the Scatter to create a winning pay line. Yet it is when the Wild is found on the 3rd reel that players will benefit even further. At this point when in the base game the Wild will Expand to fill the whole of the 3rd reel. 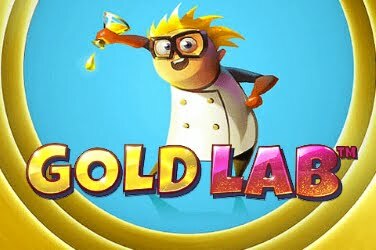 But should this occur while the player is in the Free Spins Bonus Round they will see it Expand across the 2nd, 3rd, and 4th reel, giving players more opportunities to increase their winnings. A delicate Teapot is the Scatter symbol in this online slots game. If the player can spin 3 or more of these then they will activate the Free Spins Bonus Round. 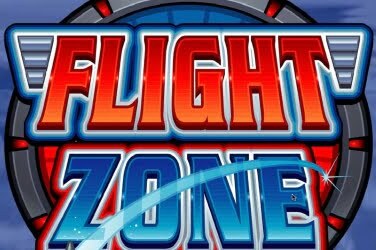 Here 15x Free Spins are awarded and the round can be re-triggered at any point. 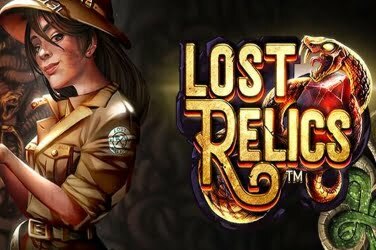 Unfortunately, there is little else on offer for players to enjoy, which means the game may not be appealing to regulars to Microgaming online casinos. There is no Progressive Jackpot to aim for, nor is there any Multipliers or Gamble Feature for players to maximize on their jackpot figure. And there are no Mini-Games to provide additional fun from the rather repetitive format that has been created with this 2016 release. 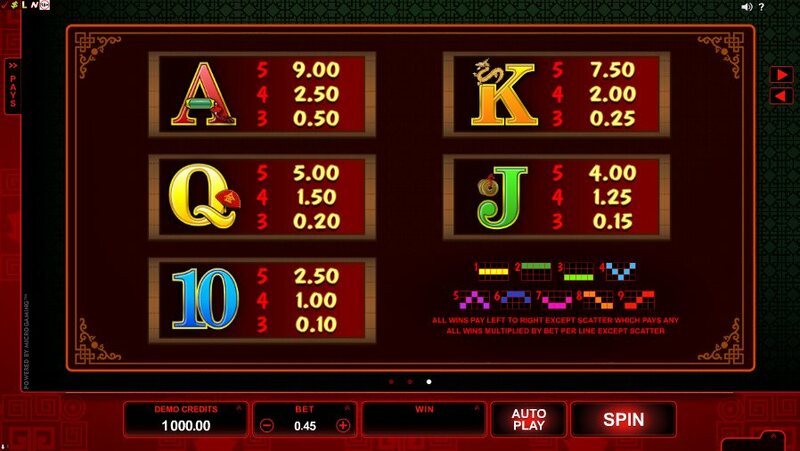 With 9 winning paylines, players are able to place a maximum of 5 coins on each. The coin’s denomination begins at $0.01 and rises to just $0.50 which will prove appealing to low rollers. It is considered a medium variance game though it does boast an RTP of 95% for players to take advantage. Winning amounts may be considered low by some players but they occur often so there are plenty of chances to increase the final jackpot figure. 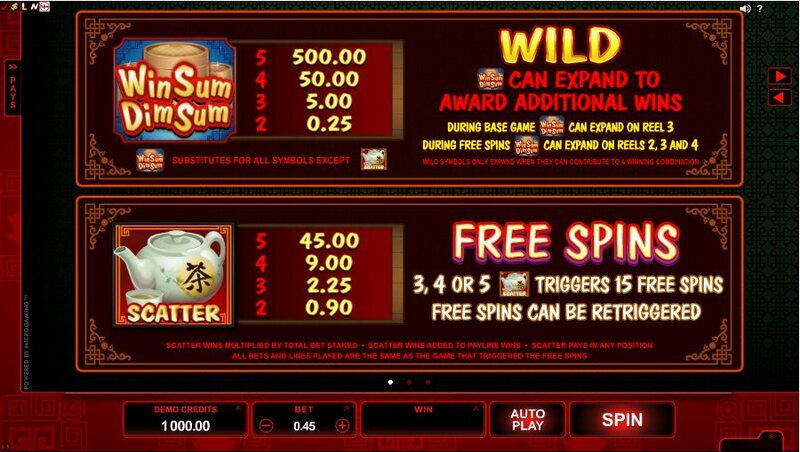 With Wilds, a Scatter, Expanding Wilds and the opportunity of up to 30x Free Spins its slow pace could be ideal for beginners. 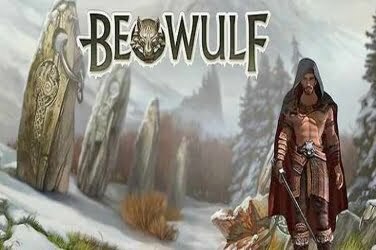 Those players who prefer all the additional Bonus Features which are usually found in online slots games maybe considering it to be rather dull. As well as being available on Mobile devices, players can also activate the games AutoPlay feature. It is useful for those who wish to be less interactive with the software and means that the 5 reels can be set to spin automatically. Any winnings during this time will be added to the player’s final pay out the amount which they can then return to claim. This is an uninspired online slots game but there are players who will enjoy the Chinese restaurant theme. Absorbing the relaxing atmosphere with the appropriate soundtrack that plays in the background. 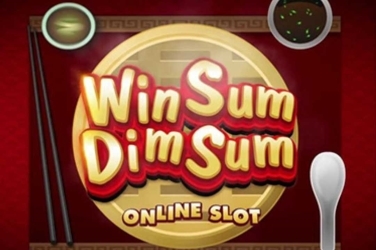 The Win Sum Din Sum slots game has been created with beginners and low rollers in mind. Allowing them the chance to increase on their initial wager by creating the 9 winning paylines that are on offer. Adding to it further when the Bonus Symbols are located on the games 5 reels.